Published June 10, 2000. Reprinted with permission from LDS Church News published by the Deseret Morning News. WEBSTER, ILL. -- More than 50 descendants of Ute and Sarah Gant Perkins, along with friends and officials in Illinois, dedicated markers honoring the place known in Church history as Ramus or Macedonia, in ceremonies on Saturday, May 21. Today the tiny town's name is Webster, and it is located about 20 miles southeast of Nauvoo.The in-town marker honors and tells about the town's settlement and history, its Mormon connection, and the Ute Perkins family. Members of that family were original settlers and early converts there. At the morning dedication service, Nauvoo Illinois Stake President Durrell N. Nelson presided. Non-Mormon Webster resident Wilbur Scheurmann, who donated the land on which the marker stands, expressed his pleasure for being able to help memorialize the town's history. Rob Clark, vice-chairman of the Mormon Historic Sites Foundation, explained his organization's goals relating to preserving LDS historic sites, including their newly announced project to develop a historic district in Kirtland, Ohio. After that marker was dedicated, the group adjourned to the Webster Cemetery, two blocks away. There they unveiled and dedicated two cemetery markers. One is a headstone for Ute Perkins, who died in 1844, and wife Sarah Gant Perkins, who died in 1845. On the cemetery marker's back side is a short history of the Perkins Settlement, Ramus/Macedonia, and Webster. The other marker memorializes six other Perkins family members believed to be buried in the cemetery. Webster Cemetery also contains headstones for Katherine Smith Salisbury (Joseph Smith's sister) and Annie Pixley Johnson, wife of Mormon stalwart Joel Hills Johnson. At the dedication, Waldo Perkins, the family member who organized the project to establish the marker, explained how the Perkins family settled the area, told about LDS Church developments there, and related how the marker came to be. He began the project after visiting Webster in 1983 to see the gravesites of his ancestors, Ute and Sarah Perkins. Headstones known to be there a decade before no longer could be found. He decided then that the family must do something to memorialize Ute and Sarah and the "Perkins Settlement" they founded in the 1820s. During the past two years, Brother Perkins, working with the [Mormon] Historic Sites Foundation, Nauvoo Restoration Inc., Hancock County people, and LDS historians, found a suitable site for a historic marker, created its text, and arranged for it to be manufactured, shipped and installed. Then he arranged for a Church history bus tour for his Perkins relatives to see Missouri and Nauvoo area sites, that culminated with the marker's dedication on May 21. 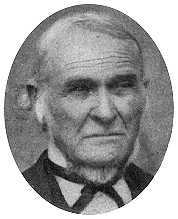 In 1826, 65-year-old Ute Perkins, a Revolutionary War veteran, became the first permanent white settler in Fountain Green Township, Hancock County, Illinois. He and his wife, Sarah, with their sons, daughters, spouses and grandchildren -- 12 original families -- founded or lived near Perkins Settlement, as it became to be called. The first person buried in what is now called the Webster Cemetery was Ephraim Petillo Perkins, who died Sept. 15, 1834. Between 1834 and 1860, other Perkins family members died and, undoubtedly, were buried in that cemetery. In 1839 Joel Hills Johnson and other LDS missionaries preached in the settlement and converted the Perkins family and many neighbors. They became organized as the Crooked Creek Branch. A year later Hyrum Smith organized the Ramus Stake there, with Joel H. Johnson as stake president, in charge of a membership of 112. It became the main Mormon center in Hancock County outside of Nauvoo. At that point the town of Ramus, which means "branch," was laid out. The Saints there built their own meetinghouse for Church services, one of the first LDS meetinghouses ever built just for that purpose. External and internal problems led to the stake being dissolved in 1841, but it continued until 1846 to be an important branch. At one point Joseph Smith's uncle, John Smith, presided in Ramus. Another person well-known in Church history who resided in Ramus/Macedonia was Anson Call. Joseph Smith visited there several times. During his visits in April and May of 1843, he received revelations now published as Doctrine and Covenants sections 130 and 131. These deal with the afterlife, Christ's second coming, the immutability of law and the eternal nature of marriage. In 1843 the Illinois legislature incorporated Ramus, giving it the new name of Macedonia. At its peak in 1845, Macedonia had about 500 residents. During the exodus from Illinois in 1846, a major portion of the Macedonia saints traveled together as the "Macedonia Company." They crossed Iowa, then wintered 20 miles east of present Council Bluffs, Iowa, creating a settlement they named after the one they left, Macedonia. By the end of 1846, their former town of Macedonia in Illinois contained two dozen or more vacant homes once lived in by Mormons. Wow! I'm so glad to have found your blog. I love all of the research you have been doing. I'm a descendant of Joel Hills (Then Seth, then Parley, then Maude, then Maudeen). Thank you for this! It's made my day.